I’ve been working for several months now on a project called “Below Sea Level”, part of the show “These Days: Elegies For Modern Times” at Mass MoCA. You may already have read my post on capturing panoramic video footage, “Shooting immersive video in the field”. After a long, sometimes arduous, but always exciting voyage, the project is almost ready to show. Richard and Dante at Mass MoCA have built the theater and set up the amazing custom-built projection rig, and I have completed the software to manage the projection. Now Pawel Wojtasik (video artist), Stephen Vitiello (composer) and myself are putting the finishing touches on the edited video and score. It’s an extremely ambitious project, and I’m thrilled every time we try out new things in the space. 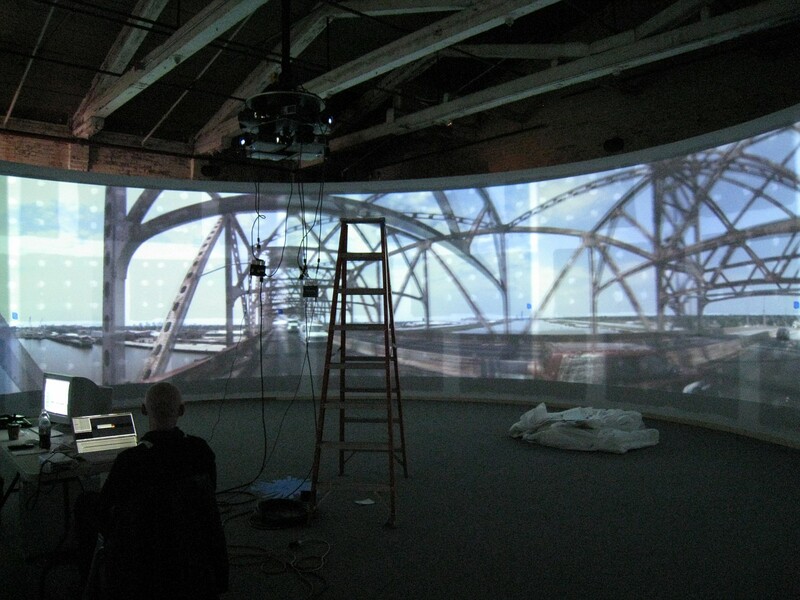 Dante Birch of Mass MoCA designed and built a system for supporting no fewer than eight projectors, perfectly calibrated for the circular theater. 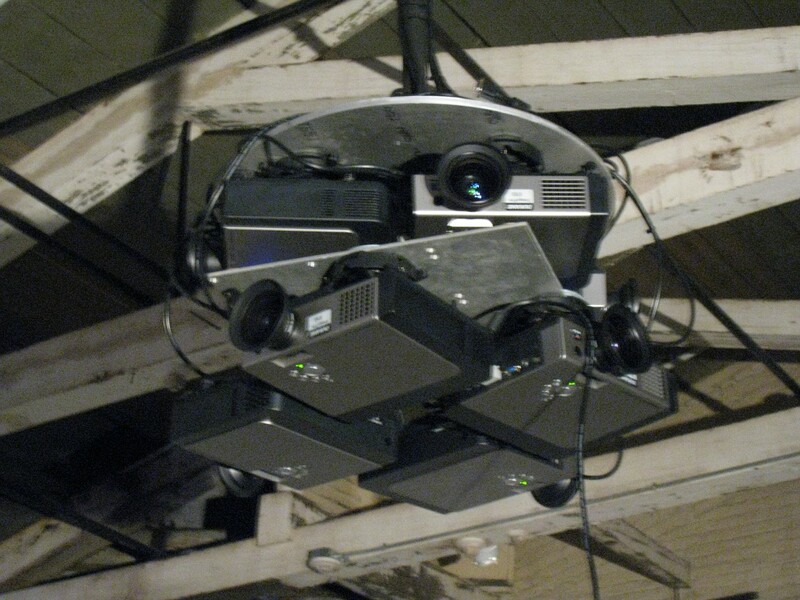 The projectors are fed by a very powerful computer, an Apple Mac Pro with eight CPU cores and three graphics cards. The graphics cards drive three Matrox TripleHead2Go units, 2 of them driving 3 projectors each and the last driving the remaining 2 projectors. The computer is running a custom Max/MSP program designed by myself, that handles time-accurate playback of both the video and audio content of the installation. The sound for the piece has been composed by Stephen Vitiello, and is presented in 5.1 channel surround. 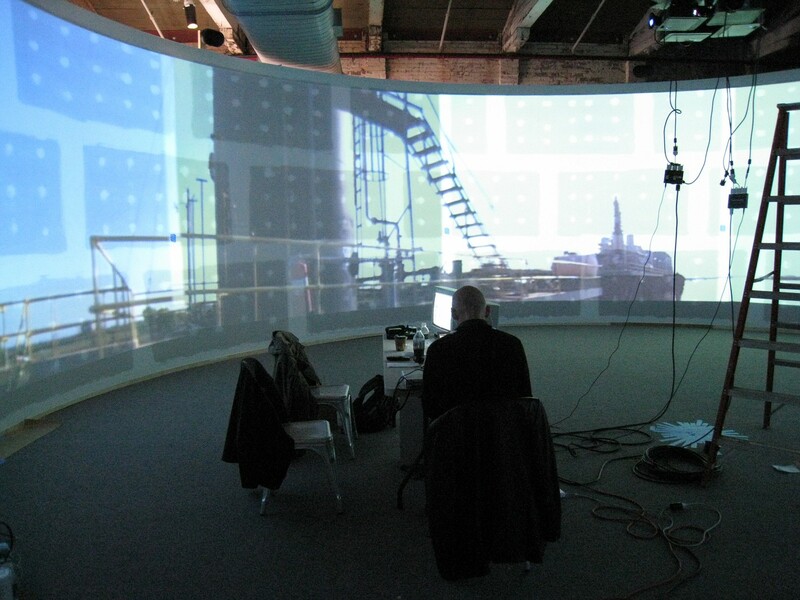 Using panoramic video footage in this space has been full of exciting challenges. I don’t want to give anything away, but I am sure that visitors will be seeing a side of New Orleans that will be entirely new, and in ways that will be surprising and thought provoking. The first chance to experience this, and many other works, will be at the opening reception on April 4th.